I can not imagine what the parents of this poor child are going through. With so much pain and loss already for those of Orlando, this news comes like a kick to the head while already unconscious. There is nothing I can say here that will ease anyone’s thoughts on these shocking few days in Florida. In fact I only edge towards the fear side another step, since my previous post. Yes, it is common knowledge, I’m just saying a few signs as a reminder seems like common sense to me. I don’t want to join in on the blame game. 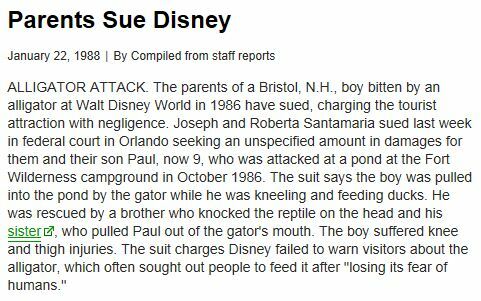 Saying Disney is at fault is as wrong as blaming the parents, though I’m sure there are many out there who find it difficult to understand letting a 2-year-old wade in any water after dark. It’s a tragedy, and blaming is just a way to try to make sense of senselessness. Discussing who or what is to blame or what should have or could have been done will not take us back in time to make things right. I bet some of you are yelling at me right now. Well, yelling at the screen in front of you. Saying, yes, maybe it won’t stop this tragedy, but discussing what could have or should have been done may help stop this tragedy from happening again. 30 years… a long time ago, I know. But just because something happened long ago does not mean it should be forgotten and repeated. Though that does seem to be the human way. I’m sure putting up signs about possible alligators in the water may not seem like a good idea to those trying to sell happiness. Besides everyone knows they are there, it’s Florida swampland. But I’m guessing there will be signs now. This post is just my own attempt at making sense of senselessness. I mean no disrespect to anyone in posting it. My prayers and deepest sympathy go out to this boys family and to all the families in Orlando grieving today. As usual, there is not much more I can say then that, and that is nowhere near enough.